In this catalog your recipient will be able to choose from a full set of Bosch power tools, a pool table, flat screen Sony TV or how about a 220 bottle wine cellar, Diamond Drop earrings or a Carnival 3 day cruise plus host of wonderful gifts. This catalog comes with a white presentation envelope, insert sheet and white catalog sleeve. All shipping & handling within the contiguous 48 state is included. This will be displayed on the front of the protective cover that your catalog comes in. This will be included with the catalog for the recipient to read. 1. Identify what dollar value(s) you would like to spend. 2. Identify how many gift booklets you need at each value. 3. Reference the website to identify the collection name(s) within the values chosen. 5. 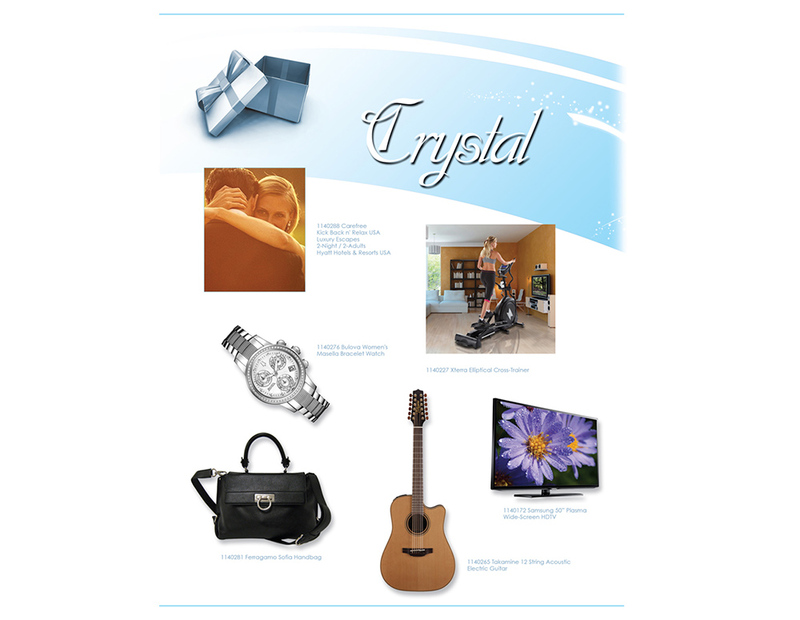 Select and personalize the theme insert sheet to match the gift occasion.